Have I mentioned how much I love summer and the fact that you can throw just about anything on the grill? Some vegetables, like peppers and even potatoes can easily be grilled directly on the grill for a smoky flavor and great grill marks. For more delicate veggies like tomatoes, asparagus, or zucchini just wrap them up in a foil packet with some butter, salt, pepper and water and you can steam your veggies to perfection! For this asparagus, we were already cooking up a pork tenderloin straight on the grill over a high flame. If you have a basket on your grill over the heat, place your foil packet of asparagus there so it's getting steamed and not direct heat. If you don't have a hanging grill basket, simply turn down your grill and cook over a medium low heat, perhaps while you are waiting for your grill to heat up. Start by washing your asparagus and cutting approximately 1/4 of the stems off the asparagus. Note: Use your judgment here, if they look particularly woody/stocky don't be afraid to cut off as much as half of the asparagus stem. 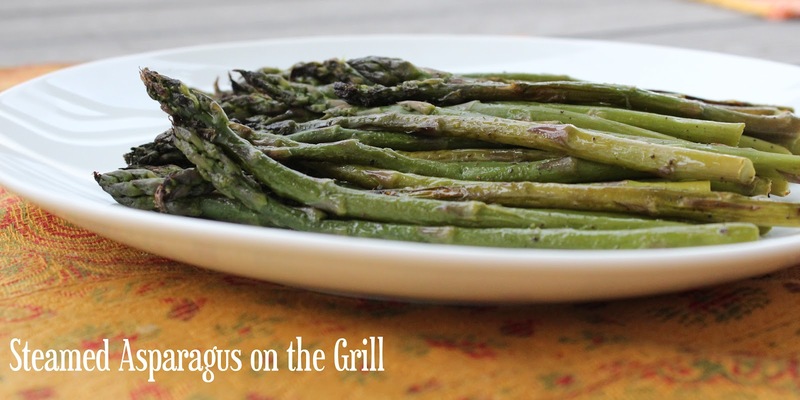 Better to have less asparagus that is edible than more asparagus that is hard and inedible. Using a medium sized piece of foil, create a packet to hold your asparagus. Spray the packet with olive oil spray before adding your asparagus. Then add butter, salt, pepper and water to packet, sealing ends closed tightly. Place over indirect heat on the grill for around 15 minutes. Some of my asparagus on the bottom burned slightly but the majority were perfect. Try checking half way through and stirring if necessary to prevent sticking and any stems from burning. Serve with your favorite grilled meat like salmon, chicken, or pork tenderloin.